Please excuse my lack of blogging these past many days, but we are in the process of trying not to die. 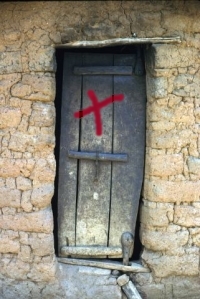 If we were living in the 14th century (nevermind you would not be reading this on your computer or phone or whatever) I am pretty sure some dear chap would be responsible for painting a nice red cross on our front door. Our house is not made of stone, but you get the idea. Carter ran a fever for two days: Thursday and Friday. Cody spiked a fever Saturday, had two seizures that were several hours apart, and is currently on day five of running a fever. My fever arrived early Sunday morning and is still going strong. Both Husband and I are exhausted from being on what we call, high alert, for so long, watching for seizure activity. We are basically a wreck. The house is trashed beyond the typical daily clutter with the added bonus of sick people filth. It is lovely. We managed to rally for a couple of hours on Halloween, when in a Tylenol and Motrin drenched haze, Cody enjoyed carving pumpkins with Carter and Husband. The boys also had an hour or so of trick or treating when Cody’s fever was knocked down with medicine. It was perhaps not the best mothering decision I have ever made but I was feeling bad about Cody missing his classroom Halloween party. Tomorrow is a new day. Perhaps it will be a fever free one too. A girl can dream. This entry was posted in Sniffles & Seizures and tagged fever, halloween, plague, seizures. Bookmark the permalink. Don’t feel bad about filling Cody up with drugs so he could enjoy a few hours of Halloween fun. I have been guilty of worse. On the morning of our big city parade, one of my girls awoke with a body dotted with chicken pox. Rather than have her miss the “big” event, I covered her body well with clothing and off we went, exposing god knows how many unsuspecting children and adults. Not the brightest decision I have ever made but at least I ‘fessed up. Hope Cody is on the mend and your family returns to some resemblance of normalcy soon. Hahaha – your story gave me a nice laugh! I figured it was a nice happy medium as we skipped his classroom party so as not to infect kids we actually know. Cody woke up with a low fever this morning so we are backing off the meds and keeping a watchful eye. Thanks for the laugh and the well wishes. Oh dear! I hope you all feel better soon! Thanks! Hope all is well with you and your canine crew. Being without power for days is almost as bad as being sick in my book. I always remember being in a school play of the Pied Piper of Hamelin. I had quite a good part, but I also had a rotten cold. I was afraid I wouldn’t be able to take part. 😦 It was only at the last minute that the decision was made (although I think it had involved bribing me into eating a little bit of cauliflower for vitamins!!) and I was thrilled to be able to go. Nothing like a little bribery to get a child to eat their veggies! School plays were the best, my favorite was when I got to play Nancy Lee, the widow, in the play Night of January 16th. Members of the audiance were chosen to be the jury and had to decide my fate. Fun stuff! We are feeling much better now, thank you.